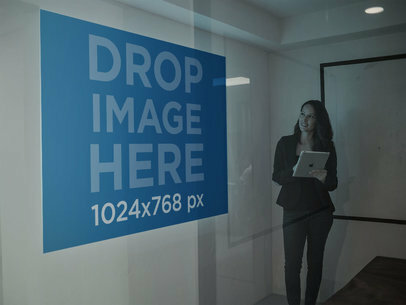 Take a look at this beautiful mockup featuring a woman checking out a presentation while at a meeting, you can customize this image to showcase your latest presentation logo or design! Do it, it'll just take a couple of seconds. All you need to do is drag-and-drop a jpeg or png image file over the interface. Yes, that's all, after a few seconds you'll see the processed image in front of you. How great is that? 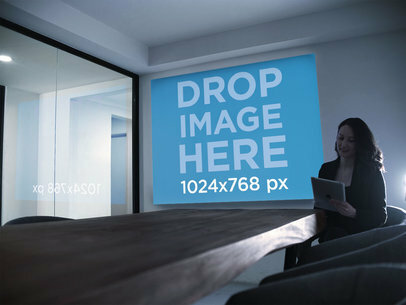 Try another Presentation Mockup! Take a look at this gorgeous visual featuring a businesswoman at an office presentation, the presentation has a reflection on the window. Start showcasing now your latest designs for a presentation with Placeit in a photorealistic way! All you have to do is drag-and-drop your jpeg or png image file over the upload button on the left. Easy, right? Try another T-Shirt Mockup!